Swarovski Crystal Sew-on Stone 3700 Marguerite Lochrose is a magnificent feminine stone suitable for fashion garments, accessories, home decor, jewelry making, and a full range of sophisticated projects. The Lochrose sewon crystal is often called a sequin because like the sequin, it has one hole in the center. Lochrose is said to literally mean "hole (in a) rose"
The Swarovski Sew-on 3700 Marguerite Lochrose comes is a various sizes, colors, and effect to suit any design theme and structure. The 3700 Marguerite Lochrose is round with a floral scallop outer edge. It is faceted on both sides. The sewon Marguerite Lochrose crystal is often referred to as margarita sew-on/beads, Daisy Spacers, Marguerite Beads or Flower Beads. Swarovski themselves classify this under their "Sew-on Stones" category. Because of their center hole, they are designed to be easily secured to garments, accessories, as decorations, and for use in embroidery. However they are just as popularly used as beads in the form of spacer beads or by stacking various sizes of these to make fast but effective earring dangles. 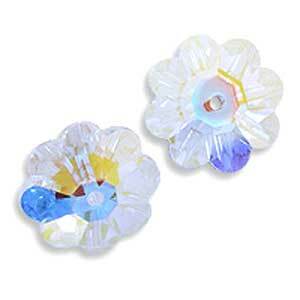 Swarovsky Sew-on Stone 3700 Marguerite Lochrose is available in these sizes. Click to view full info. Opens in new window. I so happen to have on me some lovely photos of the Swarovsky Sew-on Stone 3700 Marguerite Lochrose in the latest available color/effect, as at Feb 2012. (Photo Credit: CREATE YOUR STYLE). This is sure to whet your appetite so be forewarned!